Bicyclists and pedestrians will be able to travel along the east side of the Santa Cruz River between Silverlake Road and Ina Road – more than 13 miles – and cross only two streets at-grade when Pima County completes a paving project on The Loop in January. Personally, I think this new stretch is one of the most exciting sections of the loop if you are into bird watching as it will go past the Sweetwater Wetlands. I have had many memorable experiences exploring in this area. The one ride that comes back most vividly is of thousands of migrating birds taking flight as I rode past. The flock would fly a few hundred yards before landing and by that time I would be approaching again and they would take flight. This went on for nearly a mile. The other crossings are separated underpasses of the main roadways. 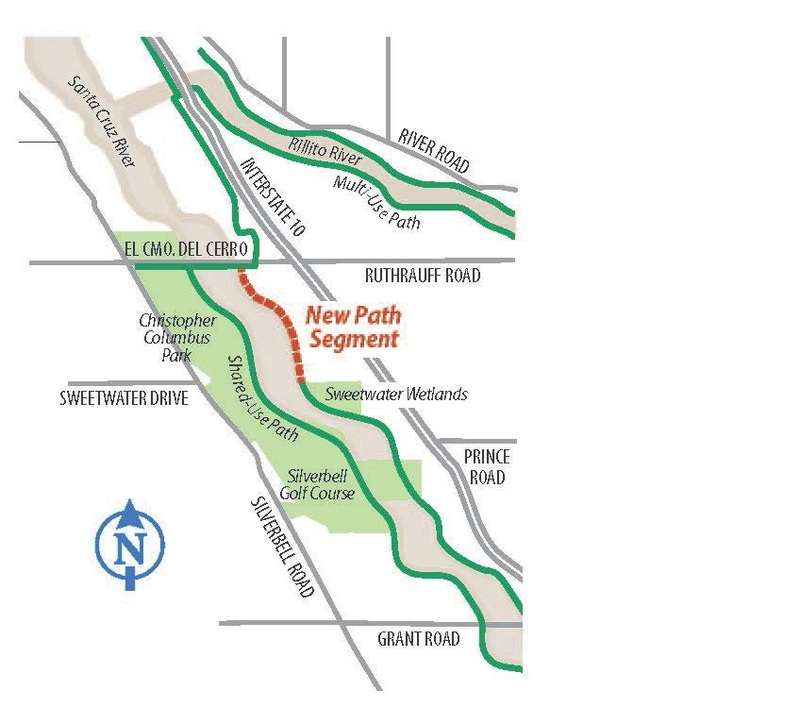 Paving of a 12-foot-wide path is expected to begin next week to connect The Loop on the east side of the Santa Cruz between Sweetwater Drive and El Camino del Cerro, the last unfinished segment between Silverlake and Ina. Bicyclists and pedestrians using the east bank will have to cross Congress Street and El Camino del Cerro at-grade. Underpasses on the route allow car-free travel at Silverlake Road, Starr Pass Boulevard, St. Mary’s Road, Speedway Boulevard, and Grant Road. The path is being installed by the Ashton Company and is expected to be completed in January. El Camino del Cerro they must travel on/along El Camino del Cerro in the on-road bike lanes or off-street pathway to the east side of the Santa Cruz to continue north on The Loop. Pima County is developing The Loop around metro Tucson with links to Marana, Oro Valley, and South Tucson for residents and visitors on foot, bikes, skates, and horses. When completed, The Loop will total 131 miles and connect the Rillito, Santa Cruz, and Pantano River Parks with the Julian Wash and Harrison Greenways. The Loop connects to parks, trails, bus and bike routes, workplaces, schools, libraries, restaurants, hotels and motels, shopping areas, and sports and entertainment venues.